Crown gold is a 22 kt (karat) gold alloy, introduced in England for gold coin manufacture in 1526 by Henry VIII. It is 22/24 = .91667 fine or 91.667% gold. Previously, gold sovereign coins were made from 23 kt gold, but this was soft and invited deliberate filing, and also non-intentional wear. The alloying metal in England was and is traditionally copper-only, although a component of 1.25% silver replacing the same weight of copper, as a softening agent, was briefly used in gold sovereigns in the one year of 1887 for better production of an image of Queen Victoria for the Golden Jubilee of her reign. Crown gold with copper as the only alloying metal other than gold, remains the standard used in the British gold sovereign, which is still minted. In the United states, gold circulating coins were minted in 22 kt. gold alloy of crown gold purity, until 1834. However, these pre-1834 U.S. coins differed from their English counterparts in containing a significant component (about 6%) of silver. In 1834 the fineness of U.S. coin gold was decreased from 22 kt to .8992 fine (21.6 kt) to discourage coin melting. In 1837, all silver was removed from U.S. gold coins and the gold content increased slightly to 0.900 fine. This 90% gold-copper alloy continued in the U.S. from 1837 until gold coins were removed from circulation in the U.S. in 1933. None of these ~ 90% American circulating-coin gold alloys contain quite as much gold as the crown gold standard. Before the mid twentieth century, all gold coins were intended to circulate as money. Contemporarily, this is no longer the case in much of the world, due to daily significant fluctuation in gold prices. A new set of modern gold coins known as bullion coins have been designed and produced in this era, each with an exact government-guaranteed total gold content, in Troy ounces. or fractions thereof. Some of these gold bullion coins are “pure” gold of 24 kt, .999 or .9999 or even .99999 fine (see Canadian Maple Leaf). 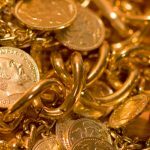 Since these coins tend to be carefully stored rather than casually circulated, the delicacy and low durability of pure gold does not create a problem. However, in a notable exception, the South African Krugerrand, first produced in 1967, and the first of these modern coins, was produced in the exact traditional crown gold recipe of 22 kt gold (remainder copper), because it was originally intended to circulate as coin currency. The Krugerrand is now considered primarily a bullion coin, and (as always) has no face value imprinted on it. A few other gold bullion coins never intended for circulation have nevertheless been produced for purely historical reasons in the traditional crown gold purity, including the gold sovereign (in exact gold/copper historical ratio), as well as now the American Gold Eagle series of bullion coins, the latter which again now follows the original (pre-1834) 22 kt or 0.91667 fine gold standard (although its silver content of 3% is slightly different from that of any coin the U.S. has previously produced).